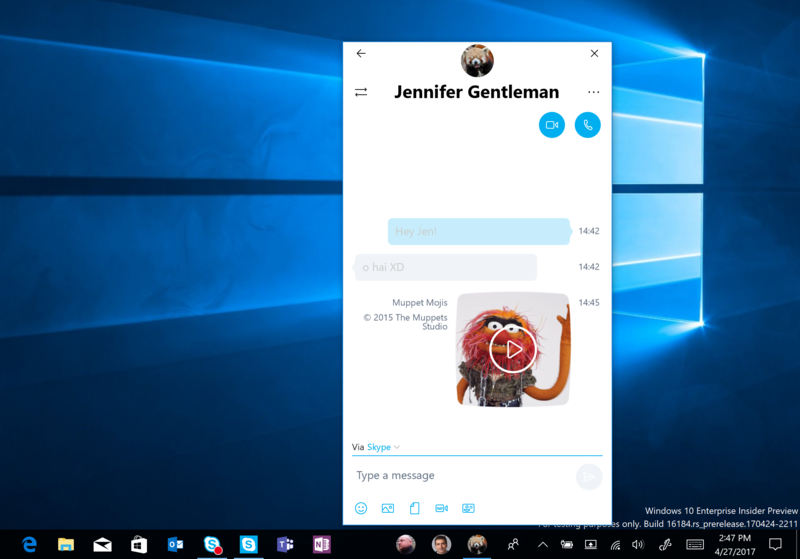 Microsoft intended to include its new My People sharing and communication app in the Windows 10 Creators Update, but had to postpone it because it simply stood no chance of being ready in time. The revised plan is to include it in the next major Windows 10 update, codenamed Redstone 3, and if you want to take it for a spin, the good news is it is now possible to do so as it makes an appearance in the latest Windows Insider release, Build 16184. To use it, open the Store, and make sure you have the latest updates for the Skype, Mail, and People apps. Provided you do, click on the My People icon in the taskbar and follow the steps. Pin people to the taskbar. The feature will suggest some to start with, or you can pick your own. You’re currently limited to three friends, but that will change in time. View multiple communication apps together, filtered for each person on your taskbar. Choose the app you want to use to chat and My People will remember this for next time. Fixed an issue where night light could get stuck in a disabled state. Updated Start to use the improved XAML scrollbar style announced during Creators Update development. Fixed an issue from recent flights where dragging an app from Start’s All apps list into the tile grid would result in Start crashing. Fixed an issue for those using Windows in Japanese, where on first login after an upgrade certain apps would unexpectedly appear at the bottom of the Start’s All apps list for an hour or until being launched, instead of the normal sorted position. Since the preview picture in Start Settings only previewed background and theming changes, which are already available to be previewed on their corresponding Settings pages, Microsoft made the decision to remove it. Improved the loading performance of the Notification Settings page. Some audio drivers have an "encoding Audio Processing Object" feature; this is commonly known as "Dolby Digital Live" or "DTS Connect". This takes the output of the Windows audio engine mix, encodes it (as Dolby Digital, DTS, or some other format) and sends it out over a S/PDIF optical link for decoding by an external audio receiver. An issue was introduced which resulted in this feature no longer working, which is now fixed. Fixed an issue from recent flights resulting in Photos crashing if you opened a picture from the Collection page and then pressed the back button in the title back. Fixed an issue resulting in Counter Strike Global Offensive hanging or freezing during game play on the latest builds (16176+). Fixed the issue where pressing F12 to open the Developer Tools in Microsoft Edge while F12 is open and focused may not return focus to the tab F12 is opened against, and vice-versa. Some Insiders have reported seeing this error "Some updates were cancelled. We’ll keep trying in case new updates become available." in Windows Update. See this forum post for more details. Microsoft has heard reports that the Action Center isn’t opening as reliably in recent builds, and is investigating.